Heading towards the midnight sun. Up until yesterday we were blessed with the most incredible dog mushing Mother Nature could bring us. Cool nights with a slight breeze, the sky turning all colors from the midnight sun, hard packed snow with an icy crust making the sled glide swiftly across barely making a trace, happy Polar Huskies running silently with wagging tails, frosty breath and shinning eyes, breathtaking scenery - glittering chunks of ice in vivid colors, spaces so wide open that they seem to extend to the end of the earth while being by glacier swept hills... Simply magnificent. Then, the wind turned to east and blasted us with another good storm - but it was nice and warm so we just layed low in the tent, respectfully reminded of earlier storms, while the dogs still howled and tumbled around not to bothered by "a little warm wind.” This morning we were met with a rainy morning and heavy mist. Pulling out our rain gear, rubber boots, and very yellow rain jackets from Lotus, this day still had its very own charm. Looking ahead, Mille had to laugh several times as she saw this big “bumble bee” very busily buzzing out commands. Yep, it was Paul ahead in his YELLOW jacket. Amazing what the changing of a jacket can do to your imagination! The dogs didn't care either - it was a good day for a run. 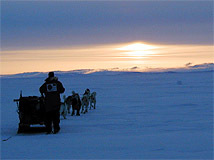 Mille thought it was like dog sledding in another world - gliding in the soft light in and out of foggy shapes. Several times she felt like pinching herself just to make sure it was all real. The famous words of her favorite Arctic explorer, Knud Rasmussen "Give me dogs, give me snow - you can have the rest" kept running through the head. 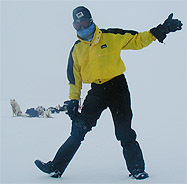 Knud Rasmussen loved dogmushing, he loved the Arctic, he loved its culture and its people. As a matter of fact, Knud Rasmussen never traveled for the sake of doing a "first” His expeditions always went where there was people. He definitely had an urge to figure out as much as possible about the Inuit - his own people - where they came from and how they had migrated. On his longest journey, The Fifth Thule Expedition (1921-24) which covered some 20,000 kilometers, he and 5 others set out to conduct ethnographic research as well as to trace "myths and stories" from his home town Ilulisat (Godhavn) on Greenland to Nome, Alaska. They actually did find that Inuit who had never seen people from Greenland or even from the south did tell many of the same stories. This led Knud and his group to believe that the Inuit ancestors had traveled east to Greenland. See that smoke in the distance? That's the steam from all the open water in Bellot Strait (!!) which we avoided by traveling overland to the west side of Boothia Peninsula. Needless to say we were HAPPY to be observing it from a distance. And the bug did not just hit non-aboriginal people. The renowned Inuit shaman "Qillaq" also thirsted for the undiscovered. He led the last great Inuit migration from the Lancaster Sound district to northwest Greenland, home of the Polar Inuit. This, the world’s most northerly populated region, has since been named Thule. It appears that Qillaq's motive were no more practical than others, as he is quoted around 1858 saying "Do you know the desire to see new land? Do you know the desire to see new people?" We do! The Quest for adventure in the high Arctic is a long one. In 330 BC, the Greek explorer Pytheas sailed north from the Mediterranean and became the first recorded voyager to cross the Arctic Circle (remember we crossed that between Baker Lake and Gjoa Haven) Link this to the report in which we mention it]. He had learned of a mysterious archipelago called Thule, somewhere to the north. Thule became an irresistible attraction to the human imagination but also an elusive goal. As the frontiers of the arctic exploration moved north, so did Thule, until it took on mythical proportions, becoming in poetry "Ultima Thule" - the land farthest north. For centuries, the quest for Ultima Thule became the pursuit of the geographic North Pole. The geographic North Pole, situated permanently in the Arctic Ocean, is the rotational axis of Earth in the Northern Hemisphere. The dream of reaching Ultima Thule became reality when Robert E.Peary and his afro American companion Mathew Hanson reached the North Pole on April 6, 1909. Some people doubt that they actually reached the North Pole - but for sure they were in the area. 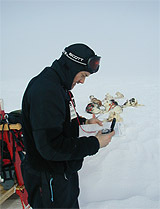 Completing one of the hardest chapters in polar history, Peary stated, "The Pole at last! The prize of three centuries, my dream and ambition for 23 years, mine at last." Still the dream did not die for other explorers. In 1986, our good friend polar explorer Will Steger proved it possible by being the first unsupported (meaning they had no re-supplies) expedition to reach the North Pole since Peary. 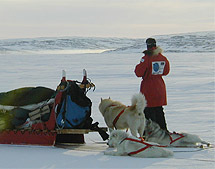 Steger and his team of 7 men and 1 woman made the journey with the help of 30 some Polar Huskies. 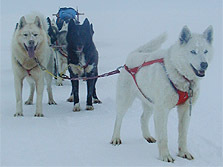 Those Polar Huskies are the grandfathers and grandmothers of our Polar Huskies on this expedition. Now traveling within the North Magnetic Pole fields, Paul has to wait quite a while for his compass needle to settle so he can align the map and check on our direction. The geographic North Pole and the much more southerly North Magnetic Pole, towards which the Polar Huskies are heading this time, should not be confused. The North Magnetic Pole is the point from which the Earth's magnetic field radiates and is in constant lateral motion having moved many hundred miles north of where it was located in 1831 (remember how we told you the Norwegian explorer Ammundsen found it only 90 miles north of Gjoa Haven). On the maps we have been using to plan our route, the Magnetic North Pole is situated on the westside of Bathurst Island approximately 90 miles (150 km) from Resolute. But as it turns out these maps are off target quite a bit. The latest satellite photos shows it having move much further north than predicted the last two years. It is supposedly now north of Ellef Ringnes Island in the Peary Channel more than 300 miles from Resolute. It is only "supposedly" because the North Magnetic Pole is very elusive. There are several different definitions of how to determine where exactly this pole is located from year to year..from month to month! See it would probably be more correct to talk about north magnetic fields from where the radiation radiates than a pole. Where ever the strongest point of radiation within these fields at the time measured, that is what we call the North Magnetic Pole. We are already traveling within these fields, but as it looks we will not be able to make what is considered the actual magnetic pole on this expedition. If so, we would have to extend the expedition a couple of weeks longer and then the conditions would probably not allow us to make it to Grise Fiord, which we think is much more important! Especially since we can already now record the impact traveling within the strong fields. The compass is out of whack! When we pull it out to navigate trying to point North, it spins and spins for several minutes. In reality, it does not really work anymore, since where it ends up pointing is not what we know as "True North" (the way the maps are orientated). But now a days, we can sort of compensate for nature’s little trick. We use what is called declination, which is the difference between "True North" and where the Magnetic North Pole is!! Basically the declination tells us how far east or west we are from where the Magnetic North Pole is. So, if we are 10 degrees east of the Magnetic North Pole our declination would be 10 degree west! (This is only about, as it is supposedly even more complicated than this). Now, remember the fields vary all the time and they do not radiate in "straight lines". So how do we know what the declination is where ever we are standing? For one, it is noted on the map. At the bottom of the map we are on today, it says "Magnetic declination 1984 varies from 30(degree)01' westerly at center of west edge to 59(degree)49' westerly at center of east edge. Mean annual change decreasing 28.5'. The magnetic compass is likely to be useless in this area!” This means that in 1984 the declination here was between 30 and 60 degrees...That's A LOT. Which is, of course, why it says the compass is useless. Except now a days we also have the GPS (Global Positioning System) which uses the satellites to calculate the declination. According to that, right now we have 27 degrees west declination. So when we hold up the compass and it finally settles we add another 27 degrees west to our direction. It is still not exact, but good enough for dogsledding speed! Cassie (white), Nazca (black), and Choko(red) all like speed! Cassie and Nazca who earn a Polar Husky Star this week are both busy bees. Each are smaller and a little hesitant with people they don't know, but besides that they have very different natures. Cassie who is an excellent and very steady point dog, is a TOUGH little lady nobody messes with (remember she whacked the wolf visiting in camp). She can also run lead, but prefers if she is following another team or if her boyfriend Aksel is in lead. Nazca is the most gentle sweetie. Still young she can be a real good point dog, though she still tends to get "bored" if the pace is slower. But keeping in mind this is her first year really running she shows good potential. Last year she became a mother giving birth to the great bunch: Griffin, Hershey, Khan, Sable, Disko as well as Sami and Elf who stayed at home this year along with their father Reggie. Now, during our last chat a class in the "Heroes and Dreams" Collaboration Zone, Michael holst cleverly asked, "Is there more pride in reaching the magnetic north pole or the geologic north pole or is there no difference?" For sure in "Arctic exploration terms" it is not as big a deal to reach the North Magnetic Pole as it is to reach the geographical North Pole. For centuries, the geographical North Pole was considered the most coveted of all polar prizes - and today the North Pole is still the ultimate goal and polar challenge for many expeditions every year. Each expedition establishing its own particular challenge; first by ski, first by hot-air balloon, first motorcycle, first green mars man, etc... and the list continues to grow! Most of these expeditions actually set off from Resolute - the next community on our way. So many expeditions going "to the Pole" come through here every year, that they call these people "ice mice!” But whether you call them ice mice, big dreamers, pole vaulters, or explorers we are sure that most that have stood at the North Pole - which ever one - or at the end of any expedition, have realized that it is not the slab of ice upon which they stood (indeed when it comes to the North Pole as the area of the Pole looks the same as the rest of the ice in the nearly 6 million square kilometer expanse of the Arctic Ocean) that was important..Rather the goal was within themselves, their personal Ultima Thule. As for us - our next goal is Resolute, where we hope to be before the end of the week so we can make it to the Qarmartalik School to have another great chat with all of you out there (Friday 25 at 2:00pm eastern time in the "A World of Resources" Collaboration Zone ). From there, we head out on the last days of our beautiful journey dogsledding to meet the people of the most northerly community in North America! That's our Ultima Thule this year - What's yours? Do you have dreams..and what is your next goal?? Think about that for a minute! If you want to chat with a person that knows a few things about BIG dreams and have taught us quite a bit on how to pursue our goals, join this weeks chat May 23 at 2:00pm eastern time with polar explorer Will Steger in the Heroes & Dreams Collaboration Zone . PLEASE NOTE: Two more reports have been scheduled: May 28 and June 4 or 7th depending on final arrival date in Grise Fiord!